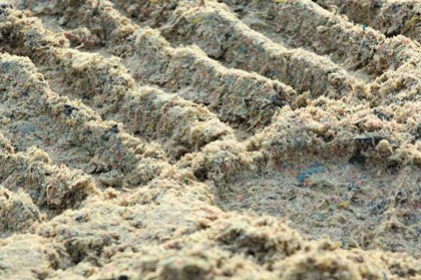 Both Dirt and Synthetic tracks are harrowed between races. Dirt tracts are harrowed between 3" & 3 1/2" while Synthetic surfaces require a shallower process between 2" & 2 1/2" The harrowing device is usually placed in back of a large tractor. Rototilling is also a common practice which is performed. This is a bit of a deeper procedure where the dirt will be turned over at a depth of 4" to 6". A grader will then level the ground as this work is completed at around a 5" depth for a smooth surface. Additives are needed at least once a year to replenish the soil on dirt tracks. Synthetic surfaces require special products to replenish the overall composition of the track depending on the geographic area and weather conditions. Dirt surfaces need to be need to be watered throughout the day to keep them moist; however, its important that they are not over-watered creating mud an slippery conditions. Synthetic surfaces range in watering. Some are watered periodically to reduce temperatures while others are not watered at all as there is a fear of wax breakdown. Poorly executed maintenance practices can lead to unsafe track conditions which can put both horses and jockeys in harms way. Its important that these practices are executed consistently and monitored by a professional and experienced grounds crew. Next time you are out at the track watching the races, take a moment to view the track conditions and appreciate all of the hard work involved.